Two weeks ago, Northern Kentucky kicked off Friday night with three undefeated local teams, deep into the season. By the time that night was over, Ludlow had been beaten up at Beechwood and fell from the ranks. On the latest Friday night, Simon Kenton met its demise at home against Ryle, on the losing end of a shootout. That leaves Covington Catholic - which roughed up the other Colonels from Dixie Heights - as the sole remaining undefeated team, with one game left in its regular season. Elsewhere, a touching moment took place during the Scott-Holmes game, when both squads presented a signed football and a Holmes jersey to the family of Eli Kindt, the 6-year old boy killed while riding his bike in Latonia earlier this month. Ryle thwarted Simon Kenton’s bid for an undefeated regular season, 56-38, Friday night at Chlorine Menefee Stadium, and did so emphatically. Senior running back Jake Chisholm’s 46-carry, 450-yard effort earned he and the Raiders a bookmark in the Kentucky high school football history books – and an especially noteworthy ‘Top-Ten Record’ mark. His record-breaking night began with time winding down in the opening quarter, as Chisholm busted loose up the middle 80 yards, breaking several tackles on his way into the end zone to put Ryle ahead, 7-0. The Pioneers mustered a field goal after its possession fizzled out inside the Raiders 20-yard line, to get on the scoreboard, 7-3. Then Ryle struck back quickly. On second-and- eight from its own 41, senior quarterback Easton Pilyer found tight end Stefan Clarkson for a 59-yard scoring play to put the Raiders up by 11, 14-3, two minutes into the second quarter. Pioneers senior Matt Shearer was intercepted by Ryle’s Jake Smith on its first play of their next drive, as Smith stepped in front of Fisher Hayden and took it back the other way for an early 18-point margin for the Raiders, 21-3. Following a Simon Kenton punt, Chisholm chipped away at the Pioneers defense with five consecutive carries to put the Raiders at midfield. However, an offensive holding call nullified the run but Pilyer’s arm and Chisholm’s legs would make up for it. On the replay of second down, Pilyer hit Clarkson for a 13-yard gain, followed by an 18-yard run by Chisholm. Clarkson and Chisholm aided another score for Ryle via an eight-yard pass play and a 16-yard touchdown run, respectively, putting the Raiders ahead, 28-3, with 4:38 left to play before the half. Shearer began Simon Kenton’s scoring possession with a 14-yard keeper around right tackle to the 43, but an illegal shift set the Pioneers back five yards. Sophomore Austin Hammack bailed out the offense on the ensuing play with a 20-yard reception near midfield to give his team a fresh set of downs. Shearer then was sacked and misfired to Hayden on consecutive plays and Simon Kenton’s drive was in danger of stalling out. But on third-and- 11, Shearer found Murray for 15 yards. Two plays later, Shearer scrambled to his left and hit Murray 30-yards down the field at the Ryle 10, Murray breaking free from two defenders for the score and a 28-10 deficit for the Pioneers. The final play before the break featured a Shearer heave down the field short of the end zone which was intercepted. Shortly after he released the ball, he was hit and subsequently limped off the field and into the locker room with the rest of his team for halftime. However, Shearer proved his potential injury at halftime was a non-factor, with a 12-yard run to open his team’s initial possession of the third quarter. Junior running back Jon Sergent contributed with a 12-yard run of his own to put the Pioneers in Ryle territory with momentum. A 10-yard screen play to Murray preceded another strong run from Sergent, this time, a 15-yard gain up the middle. Though it briefly appeared their momentum halted after a host of Raiders sacked Shearer for a seven-yard loss, a Murray 21-yard touchdown reception inched Simon Kenton closer, 28-17. The senior quarterback was again slow to get up but remained in the game. Ryle was called for roughing-the- passer on the play. The Raiders took advantage of good field position and Chisholm ran 10 times on the drive, leaping over a diving attempt by a Pioneers defender on the final play from 20-yards out, adding to Ryle’s lead, 42-24, three minutes into the fourth. Simon Kenton cut the lead to 12 on its ensuing drive with a 65-yard pass play from Shearer to Hayden but failed to convert a two-point conversion. However, the Raiders matched the big play with one from Chisholm – this time, a 65-yard touchdown through the middle and a 49-30 score. Simon Kenton senior Calvin Rump added a touchdown for the Pioneers with seven minutes remaining but their onside kick was unsuccessful, severely hurting its chances for a comeback. On first-and-10 at the Simon Kenton 43, it was Chisholm finding the end zone for a sixth and final time to put an exclamation point on his incredible night for the Raiders. 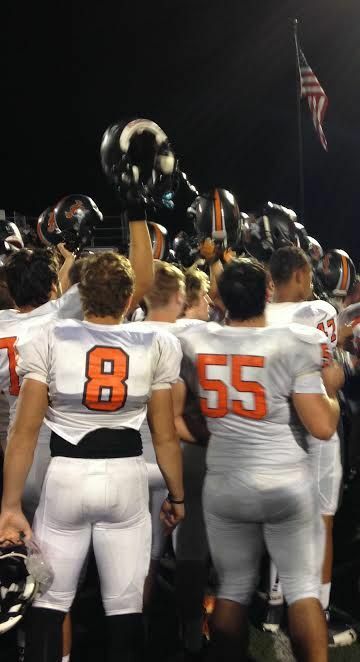 Ryle Head Coach Mike Engler told his team after the game that the ‘real season’ begins in two weeks with the playoffs and the 7-2 Raiders close out their season along Dixie Highway with a 7:00 p.m. matchup vs. Dixie Heights next Friday. 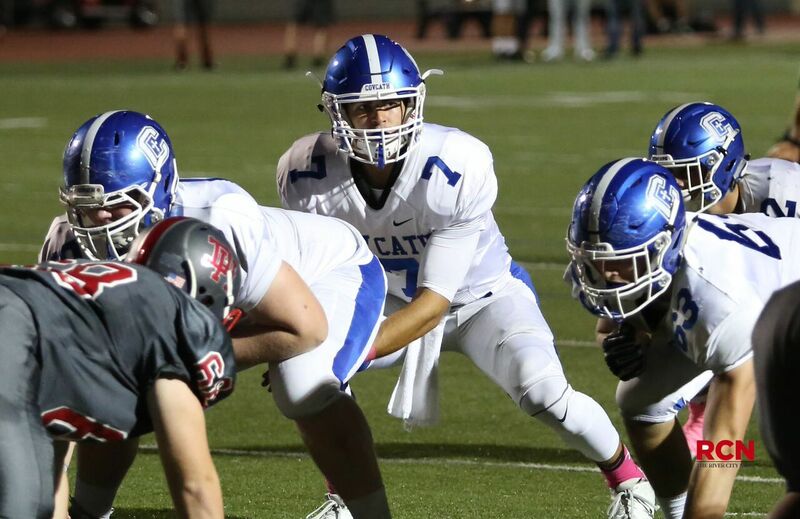 Simon Kenton (9-1) will take the field against a playoff opponent to-be-determined in two weeks, looking to begin a new winning streak when it counts. Perhaps a fitting end to a storybook night for Chisholm, Ryle teammates chanted, “MVP! MVP!” as the standout interviewed with members of the assembled news media during the postgame. Certainly, an MVP-worthy performance and one that will go down in Northern Kentucky – and statewide – history for years to come. This one was over just as soon as it began when the undefeated Cov Cath racked up a 35-0 lead after the first quarter. Senior quarterback A.J. Mayer ran the ball into the end zone for a 22-yard touchdown to get things started, and then three two more touchdowns in short order, one 27-yarder to Malachi Pike and the other a short throw to Luke Lenihan. Casey McGinness and Grant Dyer also rushed for first quarter touchdowns. 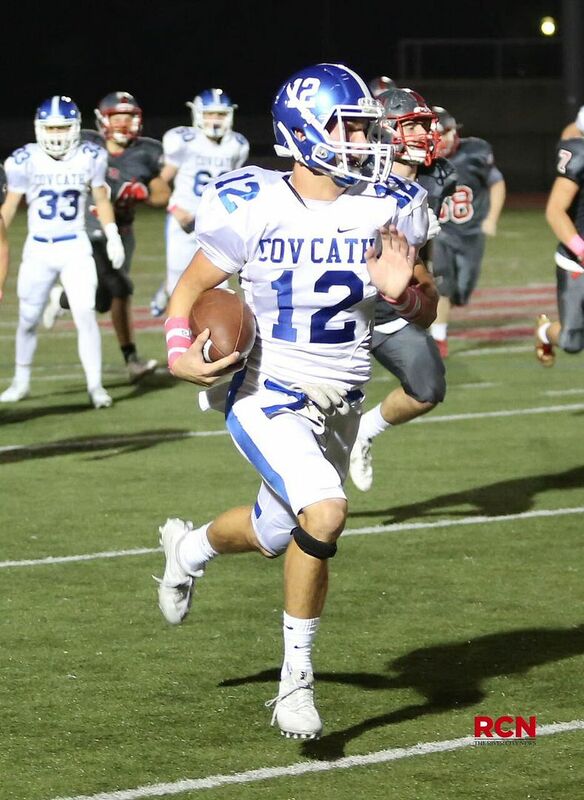 McGinness would add a second rushing touchdown just before halftime where Cov Cath led 42-0. Both teams were scoreless in the third quarter and Dixie finally got on the board in the fourth quarter when Brandon Barker rushed for a 3-yard touchdown (the ensuing two-point conversion attempt failed). Daniel Felix put the exclamation point on the Colonels' victory, running 23 yards for a TD and then kicking the point-after. See more photos from this game in the slide show below. Cov Cath (9-0) will look to complete a perfect run of the regular season next week at Campbell County while Dixie (3-6) will have its hands full at home against Ryle. The Panthers bounced back nicely from the roughing-up they got in Ft. Mitchell last week against Beechwood, which put an end to their perfect season. Ludlow (8-1) hits the road to Paris next week while Bellevue (5-4) looks to rebound at home against a tough Walton-Verona squad. Prior to the game in Covington, both teams presented a signed football and the Bulldogs offered a Holmes jersey to the family of Eli Kindt, the 6-year old boy killed while riding his bike in Latonia earlier this month. Kindt was a member of the Bengal Tigers football program. When the game got underway, it was all Eagles. Scott ran away with the victory of a struggling Holmes squad. Next week, Scott (6-3) is back home in Taylor Mill against Lloyd while Holmes (2-7) visits Newport. It was another lopsided conclusion to this storied rivalry as the Thoroughbreds ran over the Wildcats. Next week, New Cath (5-4) visits Beechwood while Newport (2-7) is at home against Holmes. It was not much of a game in Ft. Mitchell on Friday night. The Tigers had no trouble getting into the end zone, scoring nine touchdowns on the night, while the Greendeviles never broke through at all. Next week, Beechwood (7-2) is at home again against Newport Central Catholic. Dayton (1-8) will look for its second win of the year on the road in Carroll Co. The woes for the Indians continued as Lloyd keeps surging. The Juggernauts are now 7-2 on the season, winning three straight, and will have a big match-up next week to close out the regular season when they visit Scott. Meanwhile, Holy Cross finishes its regular season 0-10. The Camels picked up an easy win ahead of next week's tough test against undefeated Covington Catholic. Campbell County has put together a solid season of its own at 6-3. Boone Co., meanwhile, falls to 1-8 on the year and will host Highlands next week. After starting the season 0-7, the Jaguars have put together a nice two-game winning streak. Cooper shocked Conner when freshman quarterback Jeremiah Lee tossed a solid pass to Justin Schlarman to tie the game at 20 in the waning moments. Tori Neltner, a player on the girls soccer team, kicked the go-ahead point-after with 40 seconds remaining to seal the deal. Cooper (2-7) will try to make it three in a row next week at Henry Clay in Lexington while Conner (4-5) also hits the road to Lexington where it hopes to rebound from a three-game losing streak against Frederick Douglass. In the past four games, the Bearcats have outscored opponents 207 to 7. Walton (7-2) will look to win its fifth straight next week at Bellevue. The Bluebirds held off Greenwood on the road. Read about the game at Fort Thomas Matters. Highlands (4-5) looks to even out the regular season next week at Boone County.